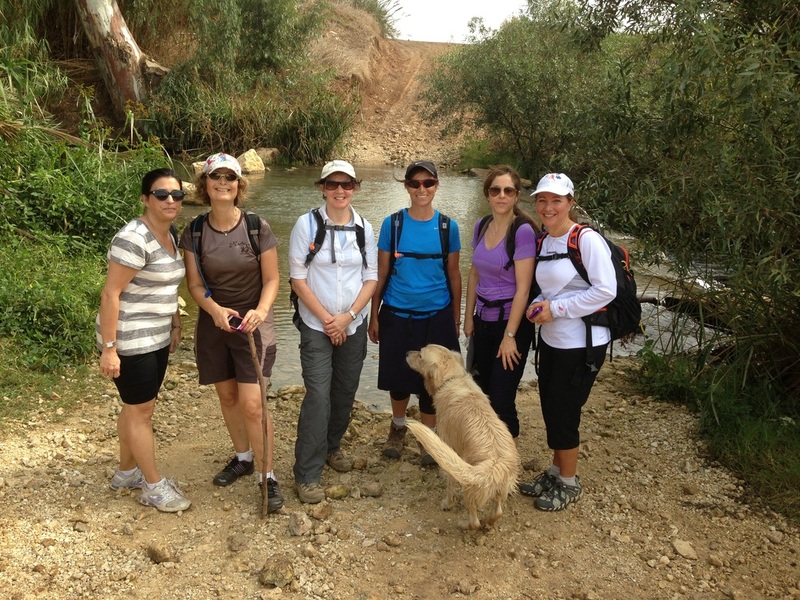 Seven of us, including an over-excited Labrador Retriever, met on Monday and hiked along the Yarkon River. We called it the ‘mall-to-mall’ hike as we walked from the Design Center in B’nai Brak to the Sharonim Mall in Hod Hasharon. Sounds urban? Apart from walking under two highways, we found ourselves ensconced in tranquil nature the entire way. 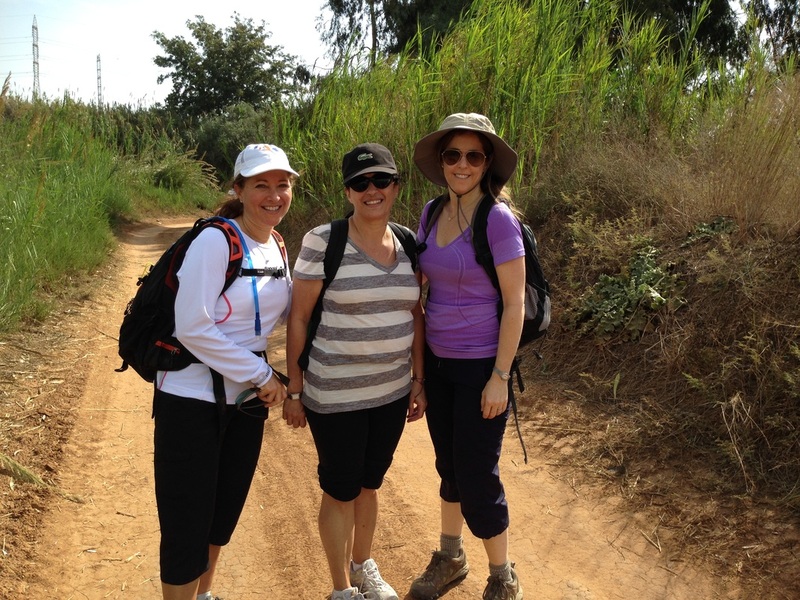 We connected with The Israel Trail just inside the Park Yarkon and it soon led us away from urban clamor into a peaceful setting of tall eucalyptus and a meandering river flanked by tall rushes. The largest coastal river in Israel, the 27-kilometer long Yarkon River has its source in Tel Afek (known in the ancient world as Antipatris). It then winds westward through Tel Aviv and out to the Mediterranean Sea. Our path followed the river most of the way. In a few places, we saw weirs that were built to help aerate the once polluted river. Apparently these weirs have special fish ladders to help fish navigate the difference in height. Over the past 15 years, botanists, engineers, tree experts, hydrologists and ichthyologists have gathered and helped to purify the water, dredge the river and reinforce the eroding river banks. Today, the Yarkon is home to mullet and tilapia and the migrating egrets have returned to its shores. 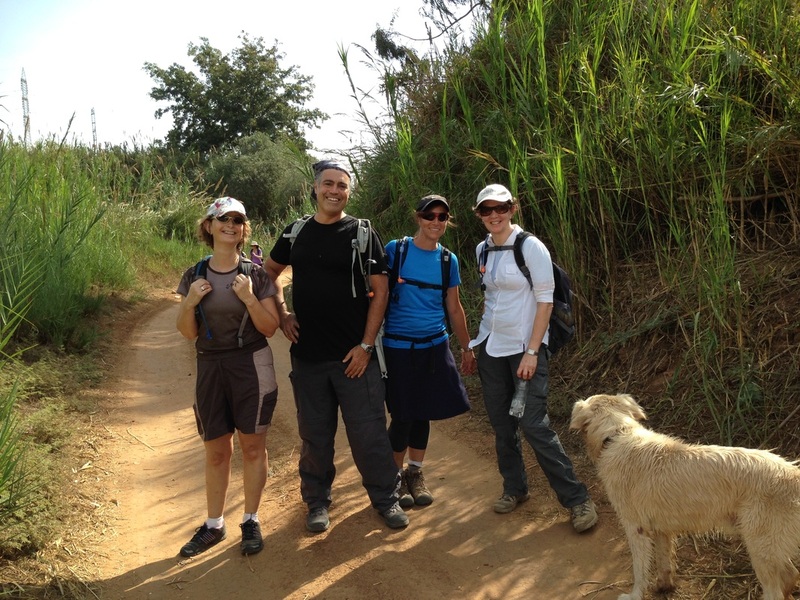 The trail was flat, pleasant and easy to walk. A warm, breezy November day, the weather was perfect for our excursion. And the trail was empty save for one other backpacker and a few mountain bikers. Most of the trail blazes were easily seen, but we did lose our way towards the very end of the hike and ended up circling around a field of sweet potatoes until we reconnected with the trail. It was a beautiful, tranquil hike that was conveniently close to home. We are fortunate to have this natural sanctuary tucked between super highways smack in the center of this country.